Add an Auto Filter plugin after Operator. Set the filter mode to bandpass, then set the frequency to about 2 kHz. 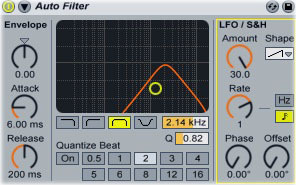 Turn the filter LFO’s “Amount” knob up to 100% and set its “Shape” to an up-ramp. Click the music note icon in the LFO section and turn the “Rate” knob to 2. Turn the “Phase” knob all the way down. Click the “Pitch Env” box. Turn the “Pitch Env” knob to around 75%, then set the pitch envelope’s decay to about 10 seconds (not milliseconds). Set the envelope’s “Peak” to -24 and its “Sustain” to +48. Play the MIDI clip; you’ll hear a siren-like synth sound being mixed into the riser. You can make the riser as long as you want: just change the filter LFO’s “Rate” knob to match the new length. For a riser that’s longer than 8 bars, you’ll need to disable the LFO, then draw the filter frequency on an envelope.